One of the most impressive colorways yet of the Hyperdunk 2010 is now available for purchase. Arriving in yet another clean look, we bring you this all new Hyperdunk 2010. 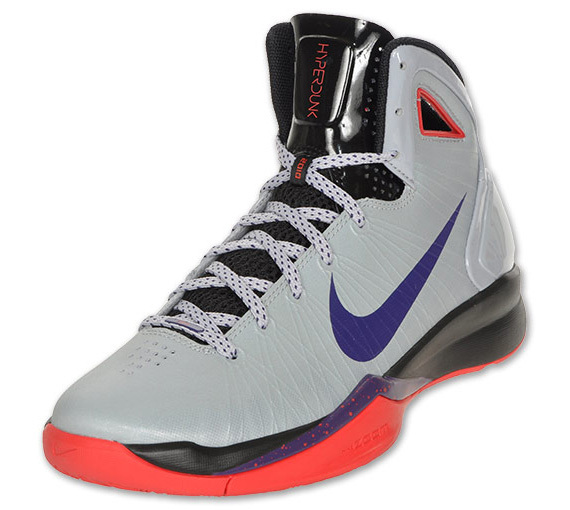 Aside from the Zoom Hyperfuse, the Hyperdunk 2010 has been one of Nike Basketball's most successful releases of 2010. Making use of an extremely fashionable colorway, this all new release is sure to keep the success going. Creating the clean look, grey is seen working most of the upper. Along with a hit of blue on the Swoosh and minimal hits of hot red throughout. Black sits on the tongue and midsole, where it comes together with purple and hot red once more on the outsole. Grey and black speckled laces are also included, adding a nice touch to one of the most impressive colorways of the Hyperdunk 2010 yet. This latest colorway of the Nike Hyperdunk 2010 is now available from Finish Line and is expected to arrive at Nike Basketball retailers this month.